Just wanted to share Snestastic's powerful and honest video of why he's chosen to quit collecting retrogames. For one, I don't collect as I feel that I'd end up in a similar plight. Certainly worth a watch whether you're interested in beginning collecting or already do. Yep. But that's not a collector's mindset. Why have 1 copy of a game when you can have all 46 known versions including the rare Serbian copy with a speeling mistake in the title? "I'm not mental, I've just got depression"
How long before he buys more stuff? He'll start collecting something else now, Blu Rays, comics, figures. You may be right. Addictive personalities are always hungry. You could say that at least collecting games is a healthier addiction than many others. Good luck to him, though. At least he's attempting something. Lord Arse! wrote: Yep. But that's not a collector's mindset. Why have 1 copy of a game when you can have all 46 known versions including the rare Serbian copy with a speeling mistake in the title? 1: No Full Sets - for me personally i've no intention of collecting a complete set of games for any system, partly because when you do that you've gotta buy so many censored games you'd never wanna play, also because some games are just ridiculously stupid but mostly because to me this is the most likely thing to get you addicted as you're counting down that list of how many more games you need for the set. You see people at trade events looking at what they "need", they're not interested in the game, just the fact they "need" it for the set and to me that's not a place i wanna be. Great post, wish I could "like" it. The only reason I'd ever do that is to make some kind of display. 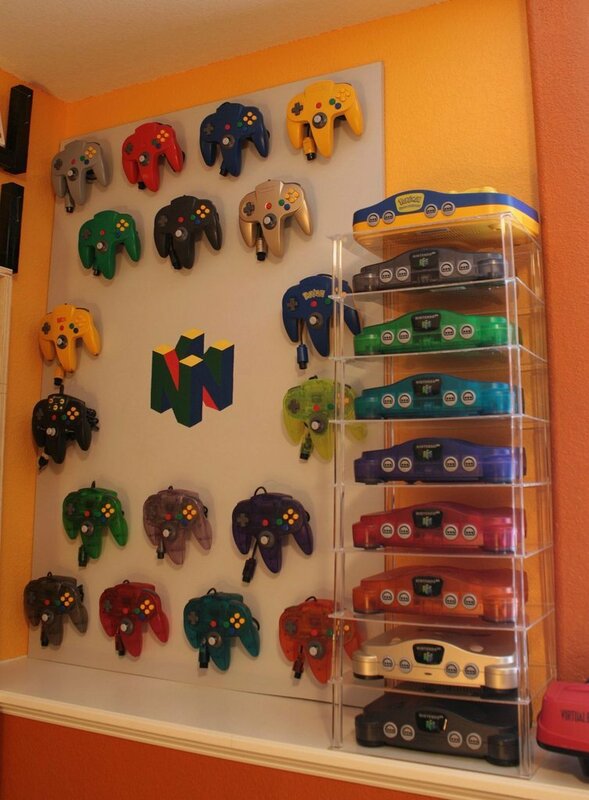 But then, whilst it would look amazing, it's a sad state of affairs to know that none of those N64s are doing what they were actually built to do. YMMV. I've seen his vids before. Even at his peak he never seems to truly enjoy the collecting. Sold some of.my collection and not buying anything more. As he said on the video. It was all about getting short term 'hits'. They don't last long and like any addiction you need more and more to get the same high. He will need to fill this void with something good else whatever it is which is always tough. His collecting seems to me more of a means to an end to get hits/subscribers for his YouTube channel.. So he stops collecting and his hits subscribers go down.. As others have said what's next blue Ray's etc? same thing as any collecting I.e people who collect video's/DVDs and Blu Rays - Lord of the Rings directors cut box set take you a day to watch all them can any collectors honestly say they have time to watch every film they buy..
About all I'd add is to try and finish a game before you buy anything new.